We’ve mentioned the shift toward advocacy marketing in recent posts as a strategy all businesses should use but should proceed with caution while doing so. Recently, Super Bowl 53 provided marketers with an excellent case study of the pros and cons of advocacy marketing. The Super Bowl is not only known for football, but for the advertisements too. The United States has an advertisement-friendly culture when compared to other countries and that’s on full display during the Super Bowl. Many Super Bowl viewers look forward to the advertisements more than the game itself, making the annually most-watched event one of the few instances where advertising is encouraged by the viewer. Anheuser-Busch always pushes multiple advertisements during the Super Bowl, from their comical and heart-tugging ads with dogs and Clydesdales to that time the beer company sent free drinking water to Houston after Hurricane Harvey. But this time, instead of dominating the viewer appreciation, they faced backlash by consumer groups and presented the perfect example of the pros and cons of advocacy marketing. Many saw these ads as an attack on farmers, who are currently struggling through the peaks and valleys the farming economy periodically sees. Corn is by far the most harvested crop in the United States. Those who rely on the crop saw the ads as an unnecessary hit job. Hashtags for #corngate and #cornspiracy trended across social media, and the National Corn Growers Association responded immediately. MillerCoors took out a full-page ad in the New York Times. The backlash was enough for Anheuser-Busch to push out pro-farmer ads shortly after. But instead of marketing with Bud Light, they used Busch Light to promote the ad. Ironically, Busch Light uses corn syrup during the fermenting process. Anheuser-Busch holds 45 percent of the market share of premium light lagers, with Bud Light leading the pack. MillerCoors is the second largest in the market, holding a meager 27 percent of the market share. It’s rare for a much larger corporation to attack the smaller competitors, so why did Anheuser-Busch choose to do so? Miller Lite is slowly gaining on Bud Light. In 2018, Miller Lite picked up 0.8 percentage points of market share in premium lights. During this time, shipments for Bud Light declined 6.7 percent and lost 0.5 percent of marketing share. (ADWEEK). It seems that Anheuser-Busch may have primed these ads by rolling out their campaign promoting FDA-style ingredient labels, something most beers and spirits do not do. This gave them an opportunity to attack competitors over the listed ingredients. 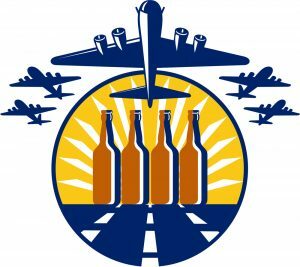 In addition, this may have been a calculated attack over ingredients, since Anheuser-Busch lost a recent challenge to MillerCoors. The challenge was against Miller Lite’s claim to have more taste than Bud Light. An advertising industry regulatory council ruled in favor of MillerCoors’s defense, (AA) but they did have to remove or modify the messaging that made it sound like consumers preferred the beers, rather than simply stating which has more flavor. Why did Bud Light attack corn syrup? MillerCoors believed these ads were meant for consumers to confuse corn syrup with high fructose corn syrup (HFCS), but Anheuser-Busch claimed these ads simply highlight the differences between the competitors’ ingredients and do not play on consumer fears. But why would you run an ad to simply “point out key differences” during an event as big as the super bowl? HFCS can be found in a number of processed foods, as it’s low-cost and has a longer life, but has faced scrutiny in the past decade. Studies suggest a link to weight gain, insulin resistance, and points out that HFCS is only metabolized in the liver. These can work individually or in conjunction to undermine the health of consumers who frequently digest it. Studies have even linked HFCS to diabetes and obesity. 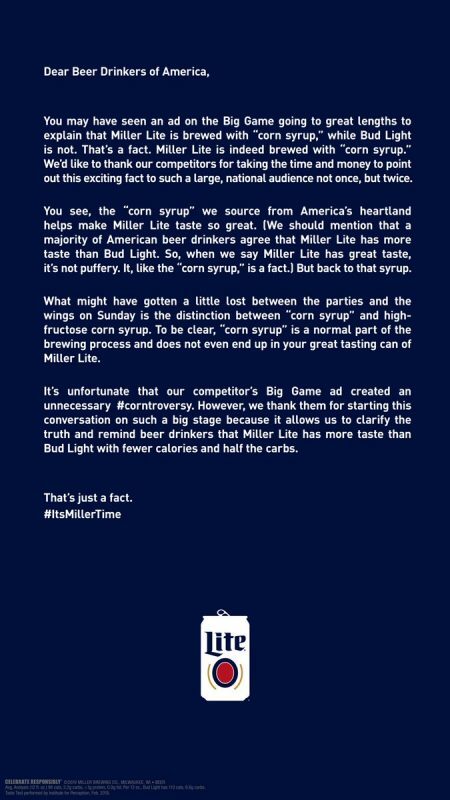 But here’s the catch, MillerCoors uses corn syrup, not HFCS, in their brewing process. While HFCS is linked to the problems above, corn syrup is not. The main difference between the two is that corn syrup is 100 percent glucose, while HFCS consists of approximately 55 percent fructose that is converted from glucose enzymatically. The glaring discrepancy between glucose and fructose is that fructose is metabolized entirely into the liver while glucose is shuttled into the bloodstream. Researchers are still examining the side effects of consuming large quantities of fructose. Even more conflicting with the Bud Light ad is that corn syrup is only used in the brewing process and is not a part of the final product. While many companies use corn syrup as a sweetener, MillerCoors uses corn syrup in the fermenting process. To summarize this process, corn syrup is used as a food source for the yeast in the brewing process, which the yeast consumes and converts into alcohol. Bud Light, on the other hand, uses rice as the food source for the yeast. This is the difference Bud Light pointed out in the Super Bowl ads. Either way, the only goal of that process is to create alcohol, not to use a specific ingredient. Even if MillerCoors used HFCS, it still acts as a food source for yeast and would not be included in the final product. It’s not about whether corn syrup is bad or not, it’s convincing consumers the use of the product is bad. Like what was stated before, HFCS has been criticized in the media for the past decade; many consumers know about the product and the associated health effects. Corn syrup, on the other hand, is a different product that has not experienced media scrutiny. How many consumers know there is a difference between the two products? And how many know there is a difference between the fermenting process and the final outcome? This messaging by Bud Light advocates for the health of their customers. But even if there was HFCS in Miller Light and Coors Light, if someone drinks HFCS-filled beer, it’s probably the beer causing the most harm. But Bud Light did win in advocacy marketing to some extent, in the form of consumer enlightenment—beer drinkers are already looking at the ingredients more often. Andy Goeler, Bud Light’s VP of Marketing told Adweek that Google search volume for “corn syrup in beer” rose 9,612 percent after the Super Bowl. 777 percent more people searched Bud Lights ingredients and searches for Miller Lite and Coors Lite ingredients grew by 1,833 and 1,375 percent. As stated earlier, Bud Light began this campaign a few weeks ahead of the Super Bowl when they began listing their ingredients on the can, something many beers and spirits do not do. MillerCoors did list their ingredients on their website, but it was difficult to find prior to the Super Bowl ads. Now, when users land on the MillerCoors homepage (after entering their birthdate) a “Nutrition and Ingredients” section is listed at the top. The Super Bowl ads seem to be the first battle in this newly-waged beer war. Based on the weekly ads responding to the competition, it looks like this is only the beginning. In the meantime, you’re safe drinking any light lager you choose, just drink responsibly. Next StoryHow Has Marketing Changed in The Last 10 Years?